In our practice, we feel our bodies, become aware of our thinking minds, and use these ancient martial arts to unite and harmonize the consciousness of the body, mind, and soul. Healing and Love are our aims. One of my teachers named his book: “Tai Chi is meditation in movement”. 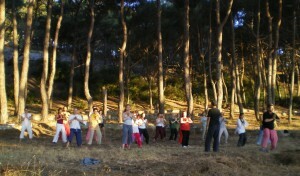 We practice together the basic principles of Tai Chi Chuan. Meditation is the basis for the conscious movement of energy. Exercises, Martial Art, Chi Kung, the Form completes our practice. Tai Chi Chuan is TAO, the Way based on Yin Yang Theory and the Five Elements.